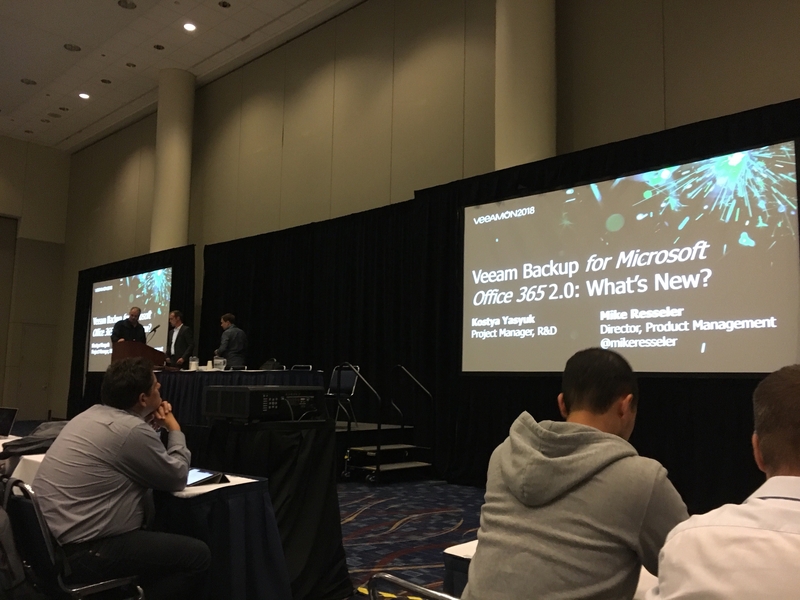 As a long time Veeam user, I was extremely happy when they introduced Veeam Backup for Office 365. With a lot of organizations moving to the cloud, it is all too easy to forget about protecting the data in there. For instance, we have a third party email archive service at work. If someone accidentally deletes some email, we could pull it back from there. The downside is that it doesn’t restore metadata with it. For example, I can’t restore it back to the original mailbox folder or see if it was forwarded at any point, or maybe see if it was marked as read or unread. Veeam for Office 365 also goes further. You can backup entire mailboxes – things like calendars and appointments, tasks, etc. So what’s coming with v2? The big focus of this release is extending support for SharePoint Online and OneDrive for Business. Although Exchange was supported in the first version of VBO, there are still some new and welcomed improvements coming in version 2. First off, there will be support for groups (mail-enabled security groups, distribution groups, and dynamic groups) – this is something that I have been waiting for. Along with this, Teams mailboxes can be backed up as well. The real benefit of adding groups is that when new members are added, they will automatically be picked up on the next replication job. You may find that you want to start building your backup jobs around groups as well. For example, maybe your senior management has a job that runs more frequently than your admin assistants. Along with this, there have been improvements to the job wizard. First off, you’ll be able to select what services for each user you want to backup: Mail, Archive, OneDrive, or Site (Sharepoint). That is a nice touch as you may not always want to back up everything for each user. Performing a restore has also had a facelift of sorts. When restoring, you’ll have the option to compare items from the backup to the live copy. A great use case here is if you have a user who deletes an email. They don’t know any specifics (e.g. from whom, when, subject, etc. ), but they think they could spot it if they saw it. Using the compare feature, you would be able to see only the items that have changed since the backup. In this case, it would be easy to pick out the deleted item. Similar to the addition of groups for Exchange backup, SharePoint backup will support groups as well. You’ll be able to back up all sorts of sites (personal sites, group sites, and subsites). There is apparently a caveat that some very specific things may not be backed up. The example given was potentially things like the formatting on heavily customized pages. Why? Apparently, some of those attributes are stored on a web server, and not within the content database which Veeam is reading from. A couple of other nifty features: you’ll be able to restore to different locations, and there is the ability to perform a comparison of live versus the backup. Backup for OneDrive for Business has been long awaited. Given that its underlying technology is SharePoint, there is a lot of feature overlap (e.g. backup up via groups). So what stood out here? First, when restoring items, it will restore attributes such as share details (who has access to what files. You can also do a bulk restore or use the compare feature to find and restore only the changes. This is useful for those situations where users have large amounts of data in there, inside of many folders. Additionally, it will also backup the versioning info for documents, which is fairly cool. Lastly, because OneNote stores info in OneDrive under the covers, you can actually backup and restore data to/from OneNote. There were a couple of things that stood out to me aside from the above. The first is the addition of a log of all accessed activities. What I mean by that is if you have an employee who opens up the backup and views data (e.g. opens up an email), that will be logged. Even if the restore isn’t actually performed. This is huge from a compliance perspective. I have written about this blind spot before, so it is great to see something being done about it. The second announcement was the introduction of the free version. Veeam has long had a variety of tools that were free, so it is great to see this tradition continue. Of course, the free tool has its limitations: max 10 users and 1 TB of data. If you are looking to protect anything larger than that, then it won’t make much sense. But if you are in an SMB, or if you want to test things out, or maybe you have your own Office 365 account, then this might be ideal. In classic Veeam form, the release date is slated for “soon”. DISCLAIMER: As a speaker, I was invited to attend VeeamON. Veeam covered costs associated with airfare, accommodations, and some meals. I was not required, nor requested to write any of the above. All thoughts and observations are of my own accord.